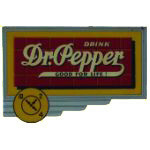 This antique service station sign features the Pontiac brand. The sign is circle, with navy blue on the outer border with a white center. 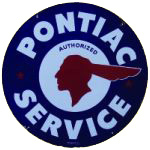 “Pontiac Services” reads the white text on the outer border. “Authorized” appears in the center white circle along with the Pontiac Indian brave logo.